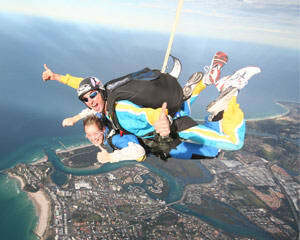 Skydive over the Gold Coast! Tandem Skydiving is the fastest and easiest way to experience the excitement of freefall skydiving, life’s ultimate thrill. On the ground you'll be suited up in skydiving gear and your professional skydiving instructors will run through a few "dirt dives" – practice skydiving exits from mock aircraft. You'll also be taught the skydiving basics of canopy control and safe landing procedures. Once you're confident with this skydiving knowledge you'll enjoy a 20-minute flight to an altitude of up to 12,000 feet where, after a final check, it's time to hop out and take the quick way down – straight onto the beach! An optional complimentary pick up service is available that picks up from Gold Coast Hotels at approximately 7:00 AM and returns late in the afternoon after jumping finishes. When can I jump? From 8am till 4pm, 7 days a week. Allow 2-3hrs for the whole event. What about spectators/photos? Spectators are more than welcome. It's exciting for them to share the adrenalin rush with you. Why not bring a picnic and spend the afternoon relaxing in the sunshine and watch the colourful parachutes opening across the skies and floating back to earth. *If you are over 95kg you will be required to pay $50 upon arrival to the Gold Coast Skydive office and your jump will more sensitive to weather conditions so you may need to be flexible with the time of your booking. Awesome experience!I was having the time of my life,best way to celebrate my birthday! Absolutely loved the whole experience! All the team at Gold Coast sky dive were very professional and great at their job. They made a daunting experience the most fun I've ever had. Gold Coast Skydive were sensational! Skydiving was 100% mind blowing. Staff were totally awesome! Fabulous experience with booking and the actual experience itself.